I am earning Rs. 1000+ every month, do you want to know how to earn from Swagbucks like me. Swagbucks is the world’s first GPT site that pays their members for doing micro-tasks, trying offers, answering polls, etc. There are different ways you can earn from Swagbucks without any kind of investment. Have you started working on Swagbucks GPT site? If No, then it is the right time to begin your online earning from this site as it is free to register and make money. This site is most suitable for all the people who are searching for some additional part-time income by using their Smartphone (or) the computer at their home. In this article, I had written in-depth research on how to earn from Swagbucks by working part-time or in your leisure time. If you are having an Android Smartphone then you can download Swagbucks App so as you can earn on while you travel. Why Do People Want To Earn Money? Most of us need money for our daily expenses and also for our survival. Money is an important factor for every individual because we have many liabilities to pay. There are so many ways to earn money either by going to a job or by doing any business online or offline. But it’s not possible for all people to earn a few hands some income through the way they are currently working. So, this makes them search for an additional source of income and the Internet does provide the same. Now, in this article, I am going to share the complete information about one genuine site named “Swagbucks”. This site is really paying me $5 many times a month thus this income help me to pay my monthly bills. Swagbucks is a search engine like Google, Yahoo from which you will be rewarded with a virtual currency called Swag points for making searches every day. This process is very simple, just tweak your browser settings to use Swagbucks as your default search engine. Usually, you will earn 5 – 10 Swagbucks every day for using their search engines. Now, they had grown as an online rewarding community and cash back system that offers Swag points for doing micro tasks. The micro-tasks includes searching for something on the web, taking part in polls and answering, playing video games and watching videos, shopping and more. Mostly you will earn SB by attending surveys and by referring your friends and others to join the Swagbucks community. You will earn a virtual currency called “SwagPoints” for every action you are doing in your account that can be redeemed as Gift vouchers or PayPal cash or prepaid card from VISA. Free to join and most genuine in payments. 140 Swag points equal to 1USD. If you have all these requirements then you can start your registration process as mentioned below. 3.) How to Register with Swagbucks? The signup process is very simple just after completing the registration form, you can create your account. After completing the registration form, Swagbucks will send a confirmation link to your email. Click the confirmation link to complete the signup process and immediately earn 30 swag points for signing up. Note: You are allowed to register one account per computer per internet connection. You should create a PayPal account to redeem swag points as US Dollars. Swagbucks is a real and genuine paying site. If you are ready to put efforts to perform tasks and refer people, you can make a lot of $5 every month. 4.) Different Ways to Earn from Swagbucks? Swagbucks is the best GPT site that pays their members on time and as a member of this site, you can able to earn a second online income through 15 Ways. By installing Swagbucks toolbar you can start to earn immediately. Just use the toolbar to search for anything on the internet and get Swag points in returns. Easy to use and malware free. In addition, you will receive some notifications while browsing the internet with the offer for free Swagbucks codes. You can use the Swagbucks coupon code for the offer price when purchasing the product during your online shopping. Also, every day when you reboot your computer you will earn 1SB. You can install the Swagbucks toolbar in your Google Chrome and Firefox to earn more SB every day. As far as like other programs, Swagbucks also provides Referral Programs where you will be rewarded with 10% of whatever your referral do on the site. For eg., When they earn 500SB you will earn 50SB. So, you will earn Rs200/- every day just by doing nothing. It is the best part-time jobs for students to earn daily Rs.200/- and at the end of the month, you will earn you Rs.6000/-. 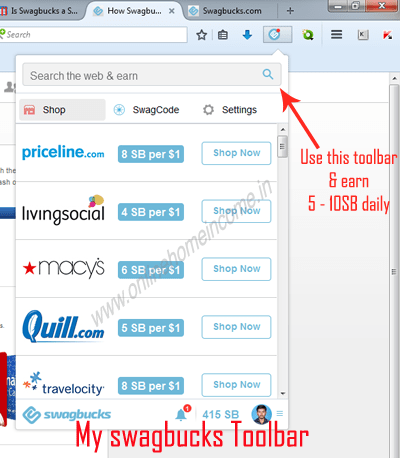 Swagbucks toolbar monitors your web activities and notifies you every time when there is an availability of any coupons. If you wish to purchase any gift card from any online store, shop through Swagbucks and earn points on every successful purchase. Also, you can log in to your dashboard > discover pages to know the currently available offers for you. Shop on eBay, Amazon and other E-Commerce stores using Swagbucks promo-codes and earn SB. When you installed the toolbar, you will be notified whenever you visit online stores. Whenever you plan to buy something from the internet, you start your search through Swagbucks offer wall. Your SB points will vary based on the size of your online purchase. Sometimes you are eligible to receive cashback offers on particular purchases. The next interesting part is attending Surveys and once you successfully completed you will get up to 1000SB. Online surveys are the second best-recommended method of Online Home Income as this job has high potential to earn money online. Attending surveys is also one of the best ways to earn from Swagbucks. After your successful registration, go to the survey section of your account and complete your profile surveys first to increase your eligibility. Another great way to earn from Swagbucks is to complete daily goals allocated to your account specifically. On successful completion of the goals, you will be rewarded with additional points which can help you earn more money. Everyone including me was using Google Search Engine every day for our online searches. From today, change your default search engine to Swagbucks to earn swag points on every search we do daily. Use Swagbucks Search for all your day to day web searches instead of Google. Yet, Google is the best. Instead of entering the phrase in Google search box, type the phrase in Swagbucks.com website search box. You can find these boxes at the top of the screen. Swagbucks is powered by Yahoo and you can get the almost same result you are expecting in Google. Attend Daily Polls under >> TO DO LIST and earn 1SB daily (30SB for 30Days). You can earn an additional 1 Swag points every day by answering the polls. It is a simple question and there will be four to five options to choose from. It will reset every 24Hrs once and thus earn you one point every day. Watch Videos of your interest and fill out your Swagbucks meter and earn 1 – 5SB for every video. Every one of us watches videos on YouTube, and same the process here will earn you money. Go to their videos section and find them interesting to play. Everyone of us like to play online games and most of you don’t know that there are possibilities to earn money by playing games. Swagbucks is one of the kind, that pay money for playing games based on your interest and earn almost 2000SB. 11.) ••• Like and share them on Facebook and receive Swag codes that can be used for any purchases. Check every day for new swag codes. 12.) ••• Same like Facebook, follow Swagbucks on Twitter and get some promotional offers through Swagcodes. 13.) ••• Follow their Instagram page for periodic updates. 14.) ••• Stay updated on Swagbucks Blog for latest updates and informations. It is the best place to for information about special promotions. 15.) ••• Use Swagbucks Mobile App on every Friday to earn more SB for using. Note: To access your Dashboard, just click on the Swagbucks logo on the top-left corner of your webpage. 5.) How I will be paid? All your earned SB points can be redeemed as Gift vouchers or real cash via PayPal or through prepaid card from VISA, later you can withdraw to your local bank account. There are different gift cards such as Clothing Gift cards, Travel Gift Cards, Hotel Gift Cards, Store Gift Cards and so one. You can choose any one of the redeeming options in your dashboard. If you wish to redeem as real money, then you can proceed to redeem as PayPal. For every 700Swag points, you will get $5 USD to your PayPal account. Go here to learn how to register a free PayPal Account. Earn $5 per 700SB and $50 per 6330SB and so on. Swagbucks is always one of my favorite “Money Making program” and so, I recommend to everyone. Even a newbie can easily score SB and earn almost $50 – $150 every month without any investment (That’s the beauty). You can earn more and more every day if you work to bring in more referrals to their platform. I am making almost Rs. 2500+ INR from Swagbucks and I normally redeem as Freecharge Gift Voucher, which I can later use for other purposes. Do you know about the free charge app? You can earn money while spending. They offer coupons which you can use every time when you recharge your mobile phone, pay for services such as DTH, EB etc. and also for other services. You will get cash back on almost every spending. I do most of my personal and office telephone, internet payments through the Freecharge app and I save my money. Dear all, this article on different ways to earn from Swagbucks have shown you a nice genuine way to make some additional revenue from your Smartphone and your computer. Start today with this wonderful method and enjoy making additional revenue. With this type of part-time jobs, you can easily pay your bills and other financial matters. Create a healthy environment through discussion in the comment section of this page. My Paying Ads Review 2017: Earn money Is Legit or scam?